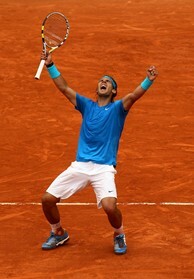 Rafael Nadal of Spain celebrates sweet victory over England's Andy Murray, reaching his second straight French Open final. 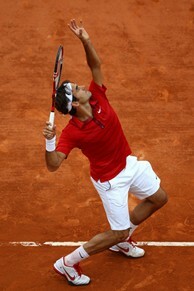 Roger Federer of Switzerland will need to play flawlessly if he is to conquer Nadal on the clay of Roland Garros. PARIS (AP) - No go, Djoko. It's Roger vs. Rafa in the French Open final again. Novak Djokovic's perfect season and 43-match winning streak were ended by Roger Federer in the semifinals at Roland Garros. The 16-time Grand Slam champion beat the second-seeded Serb 7-6 (5), 6-3, 3-6, 7-6 (5) Friday and will face Rafael Nadal in the final for the fourth time in six years. Five-time champion Nadal, who is one victory away from equaling Bjorn Borg's record of six French Open titles, defeated Andy Murray 6-4, 7-5, 6-4 earlier on Court Philippe Chatrier to improve his record at Roland Garros to 44-1. On Sunday, Nadal will try to beat Federer for the sixth time in eight Grand Slam finals. In the women's final, defending champion Francesca Schiavone will face Li Na on Saturday. Djokovic entered the French Open as the hottest man on tour. He won every tournament he had played in 2011, including earning his second Grand Slam title at the Australian Open after beating Federer in their second straight major semifinal. But for Federer, three times in a row was too many. The third-seeded Swiss had an answer to just about everything Djokovic could muster, sending back shot after shot and waiting for his opponent to make the mistakes — even though Federer finished with 46 unforced errors, five more than Djokovic. The two traded a pair of breaks in the first set, and Djokovic then led 5-4 in the tiebreaker when three unforced errors — a backhand and two forehands — gave Federer the set. In the second, Federer took Djokovic's serve to jump ahead 4-1 and held on to win it despite wasting nine more break chances. Djokovic got the early break in the third and ran out to a 3-0 lead, eventually taking the first set off Federer at this year's tournament. He also led in the fourth, and served for the set at 5-4. But Federer got his fourth break to soon send it back to a tiebreaker. Once there, Federer was the Federer of old again. He took a 6-3 lead by winning three straight points, the latter two with an ace and service winner. He then won the match with his 18th ace of the match. Despite ending Djokovic's run, things won't get any easier against Nadal. Federer is 8-16 against his main rival, and 2-6 in Grand Slams. He has already lost to Nadal twice this year, in the semifinals in Key Biscayne, Fla., and in Madrid. Djokovic had not played since Sunday, when he beat Richard Gasquet in straight sets in the fourth round. His quarterfinal opponent, Fabio Fognini, withdrew a day later, giving the Serb a free ride into the semifinals. ''What I would like to say, and I said it to him at the net, is that his record, although it's not the best because other players have done better — today it's so physical and professional — what he achieved is unbelievable,'' Federer said. Nadal reached his sixth final in seven years at Roland Garros by beating the fourth-seeded Murray. He wasn't perfect, struggling at times with his serve and getting broken three times, but his play was consistent enough to take care of his opponent's defensive tactics. Nadal celebrated his birthday on Court Philippe Chatrier with yet another victory. And against Murray, he certainly looked like the best player in the world. Nadal broke Murray early in each of the three sets. And although he lost his serve once in the first and twice in the second, Nadal always looked in charge — even helping the court crew by frequently cleaning the clay off his baseline by dragging his foot along the white paint. When the big points were played, it was Nadal who often came out on top. The wind was swirling on court yet again, at one point forcing Murray to turn around to avoid the floating red dust from getting into his eyes. A few games later, while Murray was serving in the second set, a spectator's Panama hat blew onto the clay court. A ball boy quickly retrieved the offending chapeau, and Nadal then claimed his second break point of the game when Murray sent a backhand wide. Three points later, Nadal broke for a 6-5 lead with a forehand winner, earning his second of five straight games. Since opening the tournament by falling behind two sets to one against John Isner, Nadal has won 17 sets in a row. The Spaniard's only loss at the French Open came two years ago when he was defeated by Robin Soderling in the fourth round. But he came back in 2010 and won his fifth title, beating Soderling in the final. This year, Nadal beat Soderling in the quarterfinals.